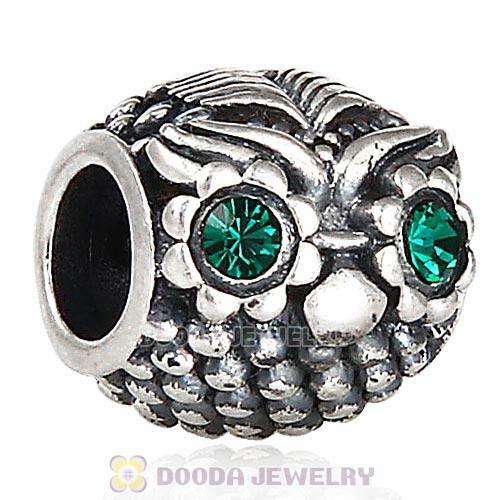 It features a sterlnig silver owl on each side of the charm with 2 dark green austrian Crystal eyes. This wise little bird wants to be part of your charm bracelet! This charm is a great gift for a teacher or student. 1. Feature: Each European style Bead made by high skilled worker, Perfect processing, 100% physical picture, fit perfectly on European Style Bracelet or Necklaces. Made with sterling silver, this dual-sided owl has two dark green crystal as eyes on either side. The owl is sacred to the Greek goddess of learning, as owls are known to be insightful, wise, protective and mystical. This remarkable piece is great to represent the teacher or student in your life.